What Went Wrong for Anheuser-Busch InBev SA? Here's why AB-InBev's most recent quarter looked worse than it actually was. Beer giant Anheuser-Busch InBev SA (NYSE:BUD) has performed well over the past year, but it's starting to show some cracks in its armor. The stock is up 11% in that time period, beating the S&P 500 Index by about two percentage points. But more recently, some concerns have popped up over the company's disappointing Q2 earnings report. AB-InBev stock fell 4% on the day it reported its most recent quarterly results, after the company missed analysts' earnings expectations by a wide margin. This has stoked fears that growth going forward may be much lower than previously anticipated. However, AB-InBev, the world's biggest brewer, is still growing at a strong rate, and the disappointment over its earnings merely stems from particularly tough comparisons. For these reasons, it appears that the company's future is still bright. Last quarter, AB-InBev's organic adjusted earnings before interest, taxes, depreciation, and amortization, or EBITDA, rose 4.6%. That is satisfactory growth that many other struggling companies would love to have. Nevertheless, that figure fell below analysts' expectations, which called for 8% growth, according to estimates compiled by Bloomberg. While the slower-than-expected growth may seem like cause for concern, AB-InBev's tough quarterly results are due to exceptionally strong performance in the second quarter of 2014. This time last year, the company benefited from the FIFA World Cup. Beer shipments declined 8% year over year in Brazil last quarter, which seems like a serious deterioration. But more than 60% of that decline was due to lapping the World Cup-related boost. Moreover, for the full first half of the year, revenue in Brazil was up 7% year over year, and management expects a similar growth rate for the full year. Another market looking shaky was Asia-Pacific, where sales volumes declined 1%. The Chinese economy has slowed down this year, marked by a stock market crash and weak consumer spending. AB-InBev is a huge company and obviously not immune from global economic concerns. But again, it's worth noting that management expects volumes will return to growth in the second half of 2015. Therefore, AB-InBev simply faced very tough comparisons and, in that sense, was merely a victim of its own success in the second quarter last year. The company is still growing in several markets and across its core brands. That's why it's likely that AB-InBev's poor quarter was more of a temporary speed bump rather than a signal of long-term deterioration. While it's easy to get swept up in Wall Street's obsession over whether companies are meeting quarterly targets, it is far more useful for Foolish investors to think long-term. On that basis, AB-InBev is doing just fine. From 2010 to 2014, the company grew revenue from $36.2 billion to $47 billion, representing 30% growth. EBITDA grew 35%, and the dividend more than tripled in that time. By focusing on its stated mission of pursuing opportunistic acquisitions and then leveraging its massive scale, AB-InBev has created a cash flow machine. 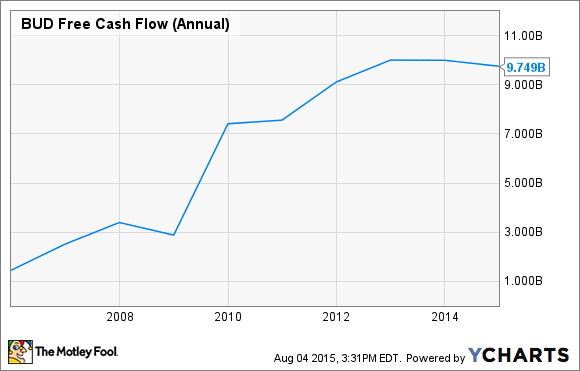 BUD Free Cash Flow (Annual), data by YCharts. As you can see, the company has done a great job of growing free cash flow over the past decade by utilizing this strategy. Its long-term growth should make investors feel much better about the short-term bumps in the road.